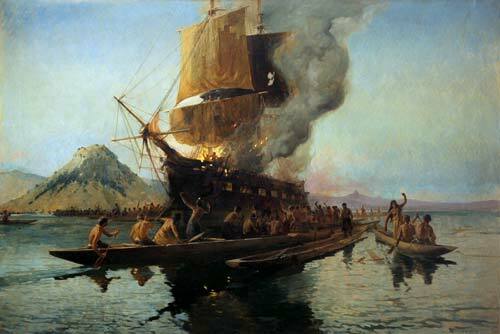 Ninety-nine years after the event, Walter Wright painted this impression of the burning of the Boyd in Whangaroa Harbour in December 1809. On a voyage from Sydney to Cape Town, the Boyd anchored at Whangaroa Harbour to load kauri spars and allow Māori to disembark. During the voyage a Māori chief, Te Ara, had been mistreated by the ship’s captain. In retaliation for this, a group of Māori boarded the ship and killed the captain, crew and passengers, and looted the ship. A barrel of gunpowder was accidentally exploded, which burnt the boat to water level. Only four of the 70 people aboard survived.